(One day, I may manage to write about our trip to San Diego.Â But, today is not that day.) Last time we worked with an architect, we wrote down things we wanted from our addition, and things we liked about the house already. I figure we need something like that this time, too. My favorite sewing space ever was in Raleigh when I lived on the 2nd floor of a Colonial Revival on Park. (Built about 1916, I think. The owners lived downstairs; my furnished one bedroom apartment with pine heart floors that I hand buffed with wax occupied half the second floor, and they rented two or three rooms to other graduate students who seemed to do most of their cooking in a microwave.) My bedroom was on the 2nd floor, and faced south, with a bank of three windows. In front of the windows there was a long flat space that ran the full width of the room. (I suppose the landlord intended it to be a desk. 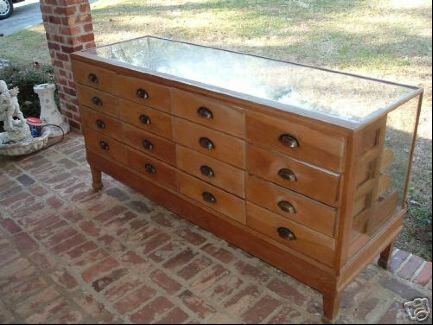 I think there were some drawers, too.) I set up sewing there. I could look out past my sewing and see interesting things, and I had good light. I was probably short on storage, but I didn’t own so much fabric then, either.Â I think the sewing flat space was not physically attached to the wall so big sewing projects had a place for the processed fabric to go. What do I need or want in a sewing room? 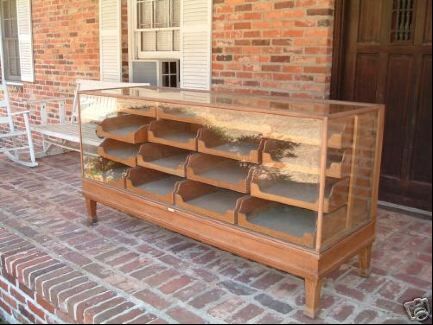 Isn’t this display cabinet gorgeous?Â There’s a yardstick embedded on the drawer side, too.Â I think I wouldn’t want a glass top, but maybe I would if I had a cutting board and an ironing board to fit on top for when I needed them. I suspect there’s more, but that’s a good start.